It’s election year, but it doesn’t have to be an election year to talk about elections related to the business of law. One type of election that could occur in any year is the marketing strategy for your firm. Advertising. Trade magazines, radio, and cable television are popular vehicles for legal advertising. Public relations. Get free press mentions by becoming an expert on a specific legal subject. Writing articles in legal publications. These publications are usually in need of quality articles. Speaking at conferences and before industry groups. Speak to groups of prospective or potential clients or colleagues who may refer business to you. Joining targeted trade associations and charitable organizations. Join committees where you will meet people and be placed near the seat of power of the organization. Conducting presentations and seminars. Communicate your expertise, enthusiasm, and availability. Creating brochures and newsletters. A brochure needs to be created only once (until it is obsolete), but a newsletter requires a regular commitment. Promoting client and law firm referrals. Satisfied clients are usually happy to make referrals. Many law firms make referrals of matters about which they feel unqualified or in which there may be a conflict of interest. Networking. Participate in networking gatherings, breakfast "lead-sharing" meetings, etc., where the participants are potential clients or colleagues who may refer business to you. Preparing mailings. Follow the rules of professional conduct in your jurisdiction. Creating firm letterhead, building signage, announcements, etc. These items are also marketing pieces. Maximizing the Internet. The Internet can be used as a regular means of communicating or exchanging information with clients and other parties to a legal transaction. Starting a blog. Display your expertise, offer your opinions, and suggest new alternatives for clients to consider. Cross-selling. It is much easier and less expensive to sell more services to an existing client than it is to find a new client. 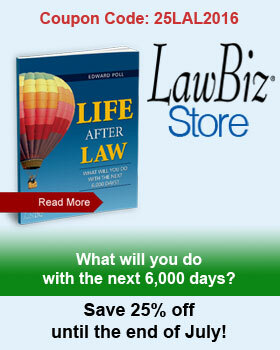 Are you looking for assistance on a new marketing strategy for your law firm? Contact a legal coach today at 800-837-5880.